The young English gentleman probably paced through the drawing room, willing his his nerves to calm. After all, it was a momentous day. He was about to meet the woman he'd grown to love, poet Elizabeth Singer, for the first time. They'd fallen in love through letters. Elizabeth wrote to him first, expressing her admiration for his work. Their friendship deepened and they'd even talked of marriage. The young gentleman, Isaac Watts, felt as if he'd found his match. Isaac and Elizabeth seemed a perfect pair, both young marvels well-known for their writing, intelligence, and grasp of theology. Elizabeth was even sought out by a bishop to paraphrase Scripture—quite an achievement for a woman at the end of the seventeenth century. But Isaac certainly wondered, would she like him? Perhaps a better question might be, who wouldn't? Isaac Watts, who may now be best known as the author of "Joy to the World," was a bit of a boy wonder. Born in England in 1674, Isaac showed an ability with words from a young age. He was also aware of his sinfulness early on, and was converted by age fourteen. As a teenager, he disliked the somber way Psalms were sung during church. Not being the sort of fellow to sit around complaining, he began producing hymns based on Psalms. His congregation adored his efforts, so he continued to write them. In the meantime, he became a tutor and later, a pastor. In 1719, Isaac published a collection of hymns interpreting the book of Psalms through the perspective of the New Testament. Psalm 98, the inspiration for “Joy to the World,” is a song of rejoicing and anticipation, looking to the day when God judges the earth with righteousness. Isaac wrote over 600 hymns in his lifetime, many of which are still found in our hymnals: “When I Survey the Wondrous Cross,” “O God Our Help in Ages Past,” and “Jesus Shall Reign.” He also published works on themes as various as theology, logic, and grammar. Among his friends were notable Christians such as Jonathan Edwards and John and Charles Wesley. He was well-respected, prolific, intelligent, and righteous. No wonder Elizabeth Singer initially wrote to tell him how much she appreciated his work. No wonder she grew to admire Isaac even more through his letters. At last Elizabeth entered the chamber where Isaac waited. Just as he imagined, she was beautiful: auburn haired, pink-cheeked, and blue-eyed. The sparkle faded from those blue eyes, however, when she took in his appearance. Contemporary accounts describe Isaac as small, perhaps five feet tall. He was often ill, leaving him with a yellowed complexion. His “disproportionately large” head boasted a hook nose. I am persuaded, that in a future state we shall take a sweet review of those scenes of providence, which have been involved in the thickest darkness, and trace those footsteps of God when he walked with us through deepest waters. This will be a surprising delight. I’m not judging Elizabeth for not being attracted to Isaac, nor am I insinuating she was shallow, cold, or a "beast" to his true "beauty." You can't fake chemistry. But I can’t help but feel for Isaac. We’ve all experienced heartache and rejection, and some days I yearn for that day in heaven when no one will ever be broken, beat, demeaned, or rejected again. Isaac never married, but devoted himself to writing hymns until his death in 1748. Today, his appearance doesn’t matter a jot, although the story of his broken heart makes him more real to me. I can relate to him a bit better, and I am even more inspired by his determination to use his gifts in service to God, no matter his disappointments, frailties, or challenges. His obedience and God-focused perspective bore fruit that still blesses us today. This December, as you sing “Joy to the World,” perhaps you’ll recall Isaac. As you celebrate the coming of our Lord Jesus, you may also be inspired to allow God to lead you through the difficult times, just as Isaac did, anticipating a “surprising delight” on that day when "heaven and nature sing." "Joy to the World" is the most published Christmas carol of all. What's your favorite? 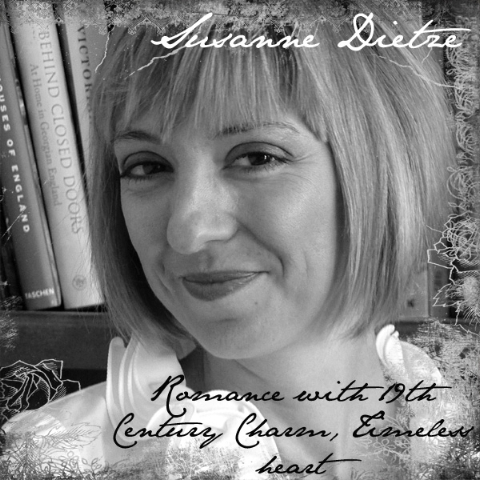 Susanne Dietze has written historical-set love stories since she was in high school, casting her friends in the starring roles. Today, she writes in the hope that her historical romances will encourage and entertain others to the glory of God. Married to a pastor and the mom of two, Susanne loves fancy-schmancy tea parties, travel, and spending time with family and friends. Her work has finaled in the Genesis Contest, the Gotcha! Contest, and the Touched By Love Contest. You can visit her on her personal blog, Tea and a Good Book, http://www.susannedietze.blogspot.com/. Susie, what an interesting post. Very multi-faceted. So many things to ponder. I had no idea that Joy to the World was supposed to celebrate Christ's second coming. And though "fairy tale" endings so often elude us here, I love his attitude about it. An absolutely fantastic post.I love the old hymns, and I enjoy hearing stories of their authors and composers. Sad that Isaac Watts was unable to find a companion, but perhaps God used that to bring so many wonderful hymns to us. Such an interesting story. I don't know if I have a favorite Christmas carol. As a child, for a time I was enraptured with "I Wonder as I Wander." But now that glaring grammar mistake makes me cringe every time I hear it. (Just that word--the rest of the song I still like.) I think I love them all. There is a large Christian radio network in NY and PA and once a week the morning show does a special look at the history behind an old hymn. I love those shows but I know I've never heard this about Joy to the World. This is a wonderful post Susie. I loved it. My heart broke for Isaac as I saw her face change upon seeing him. Your gift for writing always shows through these beautiful posts and this story, which is both sad and glorious will stay with me. I am going to listen to Christmas music all day (hopefully there'll be some hymns mixed in) and maybe I can one day answer that question. Mary Did You Know is probably my contemporary favorite but it's so hard to choose. This is beautiful, Susie. I knew his name as a writer of beautiful hymns, but I never knew this story. I feel sad for him, but I also admire that her rejection of him carried him closer to God instead of away from Him. I will never hear Joy to the World the same way again. Wow. Favorite Christmas songs - O Holy Night, and The Little Drummer Boy (more on this when I do my post). I was thinking about this some more, and I wondered about Elizabeth. Perhaps it crushed her to realize she couldn't get past his looks. I wonder if she felt sorrow and guilt. I wonder if she thought of him with regret over the years. If his portrait is accurate, I don't think he looks bad. His portrait reminded me of the guy who played Severus Snape. Alan Rickman? Not the hair, but his face. Btw, I'm kind of jealous of his hair. Good morning, Lisa! I am inspired by Isaac's attitude, too. I need to cultivate one like it. Singing "Joy to the World" has a deeper meaning for me when I keep Glory in mind. Some days I get so homesick for our Heavenly Home, and the words are truly meaningful to me. I have an affection for I Wonder as I Wander, too. (Is it the "like you and like I" part that gets to you?) Growing up, my parents had an Ed Ames record and I loved listening to him sing that song. The awe and longing for God's restoration in the lyrics move me. The song plays a sweet role in one of my favorite books, Jacob Have I Loved, too. I have a soft spot for most Christmas songs, too, LOL. Thank you, Deb. I always enjoy learning about saints; I used to think Christians past who accomplished great things were lofty, unaffected people who didn't struggle like I do. What a misconception. I have felt like Isaac must have too many times to count, and the truth is, we all have. We're all broken. So I receive encouragement from his attitude and submission to God's will. In addition to Christmas CDs, we listen to a local Christmas station as well as the "Holiday traditions" on Sirius XM. This year, I've noticed that neither of those stations has played a single religious song. I like "Let It Snow" and "It's the Most Wonderful Time of the Year" too but I feel a little hollow without the Christ-focused songs. LOL, I wondered about his hair, too, Suzie! I wondered if it was a wig. I wouldn't mind some of his hair's curl, myself. As for Elizabeth, I can only assume she felt horribly about it. She continued to be Isaac's friend, however. I believe she fell in love and married, but her husband didn't live long. Very sad. I'm looking forward to your Little drummer boy post! I like O Come O Come Emanuel. It's sort of haunting. "You can't fake chemistry." That's probably what it came down to. I think there are plenty of women who fall in love with brilliant men for reasons that have nothing to do with their looks. Agreed, Dina. Attraction isn't something you can't force. And it sounds like she fell deeply in love with another man shortly after. How disappointed they both must have been. But I think if they were right for each other, she wouldn't have minded his looks. Oh, I love O Holy Night, DeAnna. So beautiful. "Long lay the world in sin and error pining, till Christ appeared and the soul felt its worth." What a wonderful post, Susie. Watts' hymns are some of my favorites! For Christmas Carols, I always love O Come All Ye Faithful (hearing people sing the Nicene faith is wonderful) and What Child is This - what a wondrous gift of the Son born to die for our salvation. Thanks for the thoughts. Hi Karl! Thanks for coming by. I had never thought of O Come All Ye Faithful that way, but you're right! Which verse is it? "God from God, Light from Light eternal" and "Word of the Father, now in flesh appearing." Thank you! Deb, you know Ed Ames? I'm not alone in the universe! LOL. That was one of the Christmas albums that saw heavy rotation by my parents during my younger years.